Beer, the sweet elixir that draws me to the doom of oblivion, is apparently available in places called “Beer Gardens” here in NYC (and in various other locations, but this is NY-centric.) These “Gardens” are not actually gardens at all but are, in fact, large patios where people can sit and drink beer until they reach a heightened level of joviality and fun and convivial relations (until, of course, you have to fight your way to the bathroom.) But how is one supposed to find these “Gardens?” Are they secret, like in that one movie? Or are they like a mysterious Brigadoon, appearing and disappearing every few eons? Nope. They’re real, and thankfully, there’s an app for finding them. 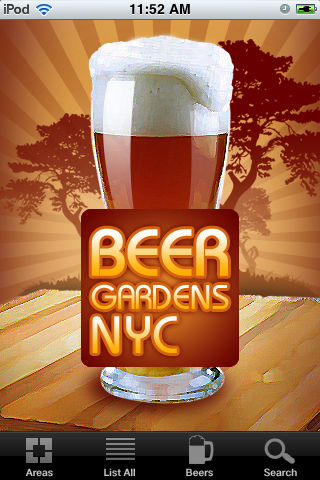 We talked about the Beer Gardens NYC app last year and they’ve just updated the app to integrate Foursquare, Facebook, and Twitter checkins along with more gardens. You can also share tips with your beer drinking friends. As before, beer garden entries include a description of the scene, photos, and videos. A directory of 900+ beers is searchable by venue and brand. You can grab the app on the app store and it works with iPad and iPhone. It costs a mere 99 cents and I think it’s an interesting app in that it reduces the “tour guide” app down to a very specific formulation, focusing on beer and beer only. I’d love a moules frite app for Paris, for example, or a whiskey app for Kentucky.